I recently had my first birthday at work in many years. Previously, I have taken the day off but this year the realisation finally sunk in that when you're at home and everyone else is at work, it's a bit boring spending the day on your own. So I made a gigantic chocolate cake and went into work to celebrate the final year of my twenties. And it seems, my workmates know me very well. I was surprised with a lovely gift of weird and wonderful chocolate-y treats - sea salt chocolate, honey, mustard and cocoa salad dressing, and the most intriguing of them all: cocoa flavoured penne pasta. So last night, my lovely friend Tara came round for dinner. Over a couple of bottles of red wine and much chatter, I prepared us a very interesting meal. I must admit, I followed the recipe example on the back of the pack as I was unsure as to how it would taste, but having eaten it, I can't wait to try it again with different flavours. Tara and I are planning to experiment with chilli, scallops, chorizo and tarragon, though possibly not all at the same time. 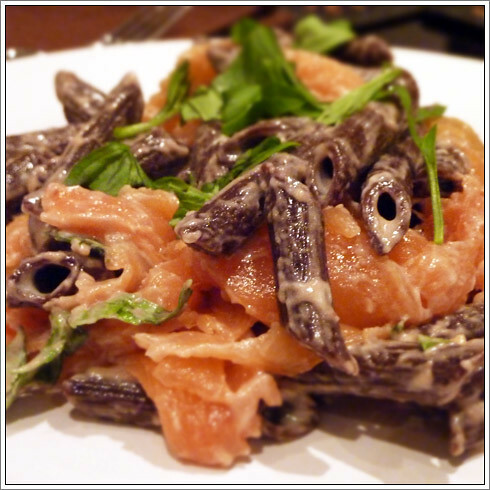 If you want to try something a bit different and rather wonderful, I'd highly recommend the cocoa penne. It's made by Hotel Chocolat and can be found here. Put the penne on to boil and cook for 9 minutes. While you're waiting for it to cook, shred the salmon into strips, grate the parmesan and also shred the basil leaves. Once cooked, drain the pasta and stir in the mascarpone. Once the mascarpone has fully melted, stir in the parmesan, smoked salmon and basil. Don't forget to hold back a little of the basil to garnish! Serve immediately - it is nicest hot. I added a little chilli oil to mine as I know that chilli and chocolate makes a fantastic pairing, though it is also delicious as is. Enjoy! Ooh this looks interesting... What does it actually taste like? Can imagine it's fairly subtle, like squid ink dried pasta, but cocoa-y? Would love to give this a try and think something strong like chilli and chorizo would be delicious... Happy birthday btw! It's very subtle. Both bitter and rich with a nice texture but the smell is gorgeous. Pure cocoa-y goodness! Smoked salmon worked well. I think stronger flavours like chilli and chorizo would work even better! What a wonderful and truly decadently delightful dinner! Happy belated Birthday!